Area 4-3 is the third course of Warped Mansion and the thirtieth course overall in Mario vs. Donkey Kong: Mini-Land Mayhem!. 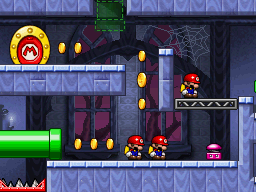 The lower two Mini Marios begin on a platform on the lower level while the other Mini Mario begins just above them, with the exit door on the top right. In order to reach it, they must simply be guided through a series of Green Pipe entrances and High Springs to it. The M-Token is located on the top right, clipping the left edge of a Girder platform on the upper level. To collect it, the lower Mini Marios must bounce on two consecutive High Springs to reach the Girder while ignoring the Green Pipe entrance. The Mini Mario Card is located on the bottom right, in an alcove only accessible via a Green Pipe entrance on the lower level. The upper Mini Mario must simply be led to it via the Green Pipe entrance closest to it.